Four-time Olympic gold medallist Alexander Popov was known as one of the most technically proficient swimmers of all time. Here’s what you can learn from his methods. Avoid fighting the water. If your stroke starts falling to pieces because you’re tired, you’re better off taking a rest. Popov’s mantra was, “if you can’t do it exactly right, don’t do it at all.” His training volume was dictated by how far he could swim while meeting his coach’s standards of technical excellence. If his stroke fell apart, the coach would end the session. Similarly, his training speeds were dictated by how fast he could swim while meeting those same standards. Popov extends his hand a long way before he begins stroking, giving the appearance of a long, smooth stroke. As you swim, think about using your hand to lengthen your body line, rather than just using it as a paddle to push you forward. As you stretch your hand forward thinking about rotating onto your side. This will help you engage your latissimus dorsi – the big powerful muscles at the sides of your chest. Popov believed there was a rhythm involved in swimming well. Part of this rhythm came from his kick. He was a sprinter, but during longer training efforts he would maintain a six-beat kick. This involves kicking three times per single arm stroke. They need to be good kicks too, with pointed toes and no bent knees. If your kicks are uneven or they are not rhythmical, they may cause a dead spot in your stroke. In addition to kicking rhythmically, Popov’s arms and hands also maintained a rhythm underwater. His arms would accelerate from slow to fast as he pulled them through the water. He would start his catch by gently engaging the water and assuming a high elbow position. Once he had this position of power, he would accelerate his arm through the water to gain maximal propulsion. So he didn’t waste any energy from unnecessarily tense muscles, Popov kept his arms and wrists relaxed during the arm recovery phase. This is something you can practice yourself. Start off by trying “finger drag” drill. This involves lightly dragging your fingers along the water’s surface, during each arm recovery. Above the water, make sure you keep your arms, wrists and hands loose. Popov would count his strokes on each length, while attempting to swim five fewer strokes (per 25 meters) than he would do in a race. His coach believed that improvements in speed would come about as a result of improved efficiency, rather than strength or fitness. To practice this yourself, try to swim 200m with two fewer strokes (on average) than you usually do. You may feel a bit awkward at first, but be patient. Soon the new lower count will feel more rhythmic and normal. It’s easy to think that unless you’re busting a gut, you’re not swimming hard enough. Popov’s coach, Gennadi Touretski, did not agree with this mentality. He allocated a large proportion of training time to low speeds, so that his athletes could focus on perfect technique. 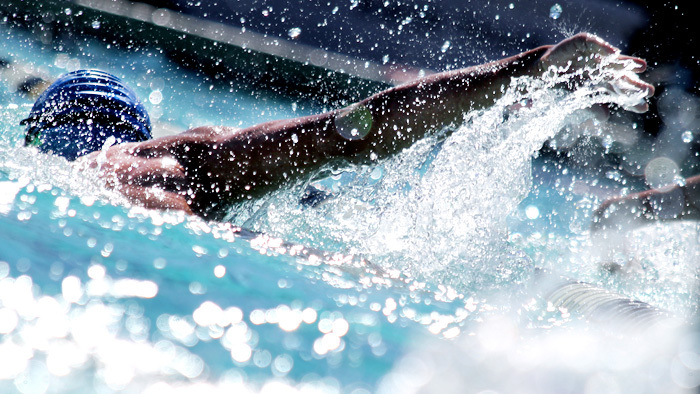 That doesn’t mean you should avoid hard efforts during your swim workouts, but you should certainly spend plenty of your pool time focusing on improving your stroke. Swimming for hours, Popov would do little more than tune in to feelings of where and how the water was resisting him. He would then creatively seek ways to avoid that drag. Drag increases exponentially the faster you attempt to swim, so no matter how hard you try, you won’t get much faster until you improve your slipstreaming. Some small part of your brain should always be thinking, “am I creating unnecessary drag?”. As a professional coach with 20 years experience, Phil Mosley works with triathletes, duathletes, cyclists and runners from all over the world. He is the Coaching Editor of Triathlon Plus Magazine in the UK and has written hundreds of features for respected names such as Runners World, TrainingPeaks, Ironman.com, Cycling Plus, BikeRadar and Cycling Weekly. He has designed more than 80 different training plans, which are available to use via the Training Peaks Store. His coaching company is called MyProCoach.net.